This week we will be checking out a mysterious European meat-eater, Metriacanthosaurus parkeri! Metriacanthosaurus was a meat-eating dinosaur that lived in what is now England, during the middle Jurassic Period, about 160 million years ago. Unfortunately, this dinosaur is only known from scant remains, but its overall adult size would have been somewhere between twenty five and thirty feet from snout to tail, judging by the bones we do have. The genus name translates to "Moderately-spined reptile". This is because its back vertebra were taller than most other theropods known at the time,, but still shorter than certain dinosaurs that had extreme versions of this trait, like Acrocanthosaurus or Spinosaurus. As it turns out, The neural arches on Metriacanthosaurus weren't really that unusually tall as more and more different kinds of theropods were unearthed. 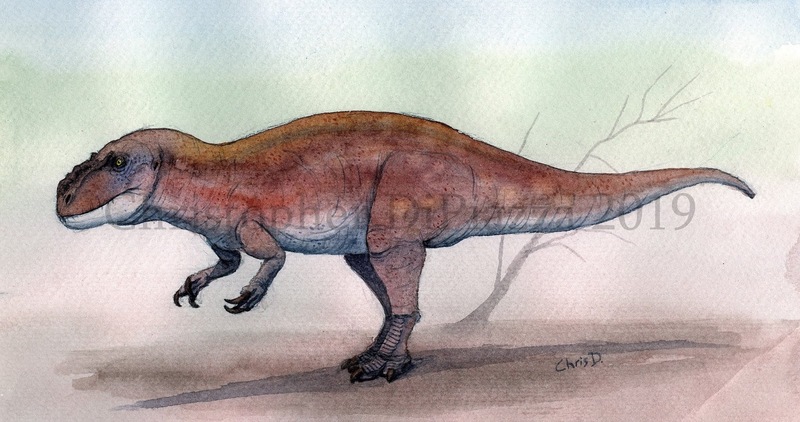 Life reconstruction of Metriacanthosaurus in watercolors by Christopher DiPiazza. This is mostly speculation. Sadly, Metriacanthosaurus is only known from a partial skeleton, including part of the pelvis, some vertebra, and part of the leg. However, this was certainly enough for paleontologists to identify it as a kind of large carnivorous dinosaur. At the time, in the 1920s, Megalosaurus was the closest known relative so Metriacanthosaurus was lumped with it. As years went on, and a greater variety of theropod dinosaurs was found and there were more specific anatomical characteristics to compare, Metriacanthosaurus was placed in its own family. Drawings of Metriacanthosaurus' vertebra and hip bones from Walker's 1964 paper. Sadly, Metriacanthosaurus' skull was never found, but based on the bones we do have of it, as of now it is considered most closely related to other large meat-eating dinosaurs within its family, called metriacanthosauridae. Most notable are two Chinese dinosaurs, called Yangchuanosaurus and Sinraptor. If it was anything like its closest relatives, Metriacanthosaurus would have had a relatively short and deep skull, with proportionally long, backwards-curving teeth, ideal for tackling large prey, like other kinds of dinosaurs. Walker, Alick D. (1964). "Triassic reptiles from the Elgin area: Ornithosuchus and the origin of carnosaurs". Philosophical Transactions of the Royal Society of London. Series B, Biological Sciences. 248: 53–134. von Huene, F. (1923). "Carnivorous Saurischia in Europe since the Triassic". Bulletin of the Geological Society of America. 34: 449–458. Naish, Darren; Martill, David M. (2007). 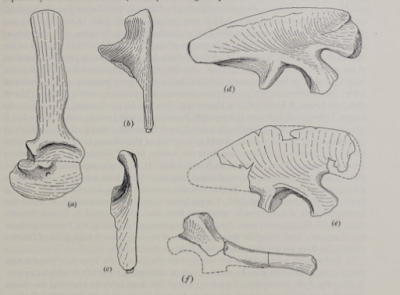 "Dinosaurs of Great Britain and the role of the Geological Society of London in their discovery: basal Dinosauria and Saurischia". Quarterly Journal of the Geological Society. 164: 493–510.